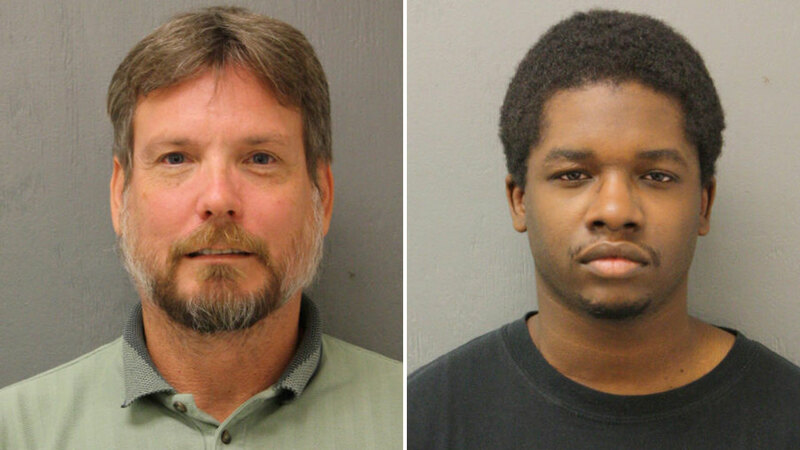 Earl Worden, left, and Phillip Turner, both members of a citizen-led journalist group called Photography is not a Crime, were arrested Monday at the Shell refinery in Deer Park. DEER PARK, TX (KTRK) -- Two men walking along the property line of the Shell refinery in the Deer Park area were arrested Monday after authorities say they refused to follow their commands. According to the Harris County Sheriff's Office, Shell's security personnel spotted Earl David Worden walking along the property's southern border around 3:40pm. A sheriff's deputy working an extra job at the refinery found Worden and told him he needed to leave for safety reasons. However, Worden became defensive and refused to give the deputy his ID, according to the sheriff's office. Officers had had to physically restrain him in order to complete their investigation. When they finally found his ID, deputies learned Worden and had been on the Shell property the day before and had been confrontation with Deer Park police officers. Deputies consulted with the Harris County District Attorney's Office and decided to file a charge of interfering with duties of a public servant, a Class B misdemeanor. Later in the day, deputies say they encountered a similar incident and arrested Phillip Andrew Turner on a charge of Criminal Trespass. Authorities say both Turner and Worden are members of "Photographer is not a Crime," a citizen journalist group. However, officials did not elaborate as to why the men were trying to photograph the facility.